As we approach the 400th, we can look back at the 300th. Then, Frank A. had his first book and was working on the second. There had been an effort to form and maintain an Old Planters' Society which had an illustrious membership. One focus of that group was to identify who was at Cape Ann and went to Salem. The list (via the Winthrop Society) included the following: Allen, Balch, Conant, Cushman, Gardner, Gray, Jeffrey, Knight, Lyford, Norman, Oldham, Palfrey, Patch, Pickryn, Winslow, Woodbury. The list associated with Conant's move was small and did not include Gardner which brought up a lot of questions, such as where was he? We look at that in this issue. We don't know a lot about Thomas. But, we can surmise that he and Margaret were seminal to the success at Cape Ann. Success? They were beyond sustenance, in mode, even though they were not able to ship to England. When Conant arrived, he didn't find starving, derelict people. One might even say that, before the large influx, the situation was idyllic. A mere three years later, Endicott lost 80+ souls due to improper preparation. The Paine sisters may have thought that Thomas went back to England for a little while. But, no. He was in the Cape Ann house when Endicott arrived. He and Margaret had kept the property up from the departure of Conant until the arrival of Endicott. Associated with all of this is the dearth of information about Thomas. We can be thankful for Rev. Hubbard who interviewed all of the players. Otherwise, those little bits would not be around. But, his manuscript was almost lost and was very much delayed in printing. So, we can thank the heavens. But, it's not a tabula raza situation, as the information is there. We just need to pull it all together and organize the things. That we now have a cloud'd interface to a growing set of data sources portends to some good research in the future. See Vol. IV, No. 1 of Gardner's Beacon for a look at the Cape Ann experience. 03/22/2014 -- I ran across this site in earlier searches: An American Family. Today, I saw that there was this page on Priscilla Grafton Gardner and wanted to add a link as she was the wife of John Gardner (born, Cape Ann). 08/15/2014 -- See What's New, this date, for change in Sources for this issue. 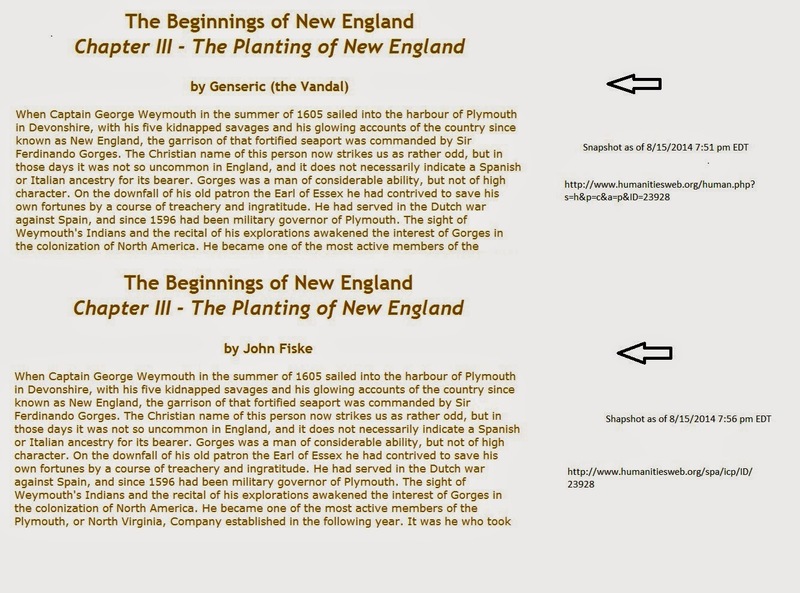 Namely, lifting John Fiske's work to view (it was being pointed to at Humanities Web - apparently lifted there, in its entirety with appropriate attribution - mea culpa, had been referenced, too, at the Thomas Gardner (planter) page on Wikipedia). --- Note: As I write this, the name has been changed. Actually, it looks as if an old pointer is around from an experimental method. Which was first? Was the "Genseric (the Vandal)" reference in some test mode? That I just happened to stumble upon and use? As I said, mea culpa. So, ..., let's some point make this a truth engineering moment. The prior post mentioned that the life on Cape Ann was comparatively good, almost idyllic. That usage of idyllic was very loose but does suggest that we take a pause to consider several things, again. When Conant showed up, he did not find starving people. Rather, they were healthy enough to be boisterous, albeit in a civilized manner. Again, there was no failure at Cape Ann venture except that of not meeting unfounded expectations. So, let's jump ahead to Endicott's early times. Then, we can consider the plight of some who came with Winthrop. Mind you, Thomas and his crew did well due to effectiveness. Endicott brought the military mindset. Winthrop brought that of the intellectuals. There is a scholarly viewpoint that points to English church-isms (of various sorts) as leading toward the emergence of the intellectual class (in some senses, ineffectiveness). Just like the Popham venture, that was successful, the Cape Ann experience was similarly effective. They were so even as they bridged the areas of Cape Ann and Naumkeag. But, in the winter of 1629-30, Endicott lost several tens of people. Sure, some may have been sick. But, others died due to exposure from lack of proper housing. Mind you, at that time, Endicott had his great house. Many died from improper diet, mainly from the fact that there was not enough food to go around. So, we can see Rev John's confusion as he finger-pointed to the Cape Ann crew as less than worthless. 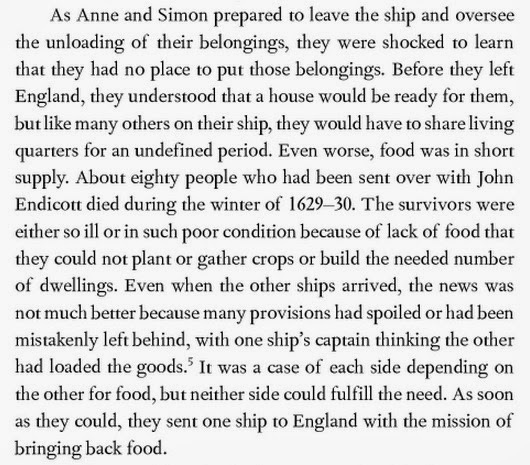 Even after Winthrop, the settlers had to send back to England for food. What a change of events? Thomas' crew was self-sufficient, yet they have been beat upon and considered failures (by a warped type of history). We have to agree with Conant, and others, that the early crew did not get the recognition that they deserved for helping to settle the area. Well, we can start the effort to tell the story of these folks who nowadays were overshadowed, in the national attention, by the ones who arrived off-course in the area to the south of Cape Ann. Of course, we also must note that New England was shipping out excess product back to England within a decade or so. Rev. John may have been gone by then (or too old to care). The image to the right comes from Kellogg's book on Anne Bradstreet (Thomas Nelson, Inc. 2010). The author remarks about the strawberries on Cape Ann. Also, he quotes Winthrop on the pleasant, garden smell that they experienced, when they arrived. We will look more closely at cousin Anne since she was very young (eighteen) when she arrived. Also, her whole take is more true than Simon's (a whole set of discussions pending). Now, looking ahead after the landing, we know that Winthrop didn't like Salem. Most who came with him, probably, were disappointed. Kellogg writes that "Anne and Simon ... were shocked to learn that they had no place" to put their belongings. Evidently, the couple had been told that there were structures, in fact houses (well, there was Endicott's), in the new area prior to their leaving England. But, no. The reality was that a few meager huts were about. Some dwellings may have been built that were of more solid stature that the wigwam; no house would have rivaled that which Endicott had ordered to be brought over from Cape Ann. One has to wonder if Thomas and Margaret helped by allowing a family to squeeze into their small place (as we now, not the Great House). And just like Endicott's entourage earlier, Winthrop's people found out that there was a shortage of food to go along with the dearth of housing. And all this lack happened despite all the planning for a "multi-step approach to settlement" that had occurred in England. But, in hindsight, we can still counsel that these things happen today. Fortunately for the new arrivals, there had been some structures (at least one with two rooms, up and down) built in the Charlestown area by Thomas Graves where Winthrop and his colleagues could go and plan their future (leaving their women, of course, in Salem's squalor - while enjoying their barracks, so to speak). We need to look further at Mr. Graves, as he, like Mr. Gardner, was of the effective type that knows how to do things. Graves had come over with Higginson a little after Endicott. For some reason, Mr. Graves returned to England, later. 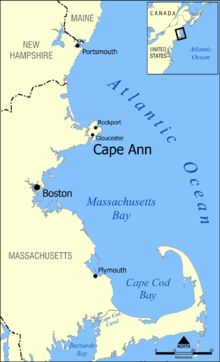 So, for a brief period, we had on Cape Ann, something that exemplified what Winthrop named but could not see. That we are still in the process of unfolding the American experience, it only stands to reason that those events of 400 years ago ought to be part of the framework from which we live and with which we think (it would be about time). And, re-telling the tales is one task even when we're faced with a tabula raza situation. 03/23/2014 - Cape Ann featured in Beacon Vol. IV, No. 1. 01/05/2019 -- Fixed pointer to the articles on Bercovitch's work (#14, Sept 2014). First example of the American way of life? 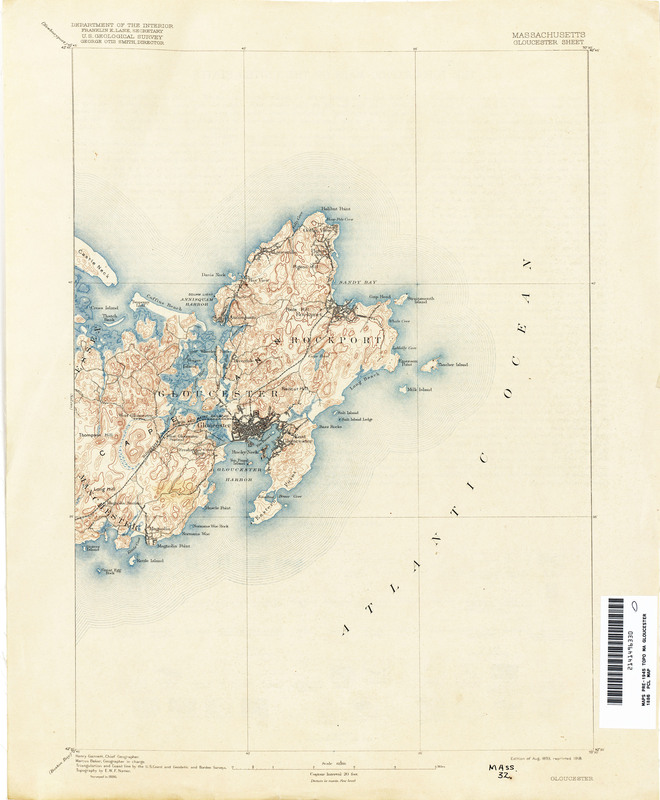 While researching Cape Ann for an upcoming Gardner's Beacon, I find that my mind keeps wandering back to my first days of research about five years ago. Firstly, there was not much written about Thomas that was definitive, almost as if he had been written out of history. Oh yes, there were the Dr. Frank books. There were many family sites that quoted from different sources. A little later, I would run into Anderson's work. He gives about Thomas six pages. Then, someone had a site based upon the Great Migration project. In essence, disparate views on the guy abound. We only know a little about him. But, we can infer a whole lot more: no shadow, effective (raised nine kids), peaceful (married a Quaker), etc. But, let's outline a look at Thomas and Margaret that will be sketched further (to answer, for one, where was Thomas?). They got to Cape Ann. Thomas was lead for the plantation. They built (the "Great House" is one piece of evidence), planted (Winthrop had their strawberries six years later after dining in the house that had been moved by Endicott to Salem), and lots more. They thrived. There was no failure. Those who look back may need to place the Dorchester Company's (from Rev John on down) unrealistic expectations in a vein like the Spaniards look for the city of gold (I am not far from where the conquistadors had the northernmost thrust - heads rolled later due to the wastes of looking after this myth). We expect to get into that backbone thing more (as the lessons still apply - offshoring, for example). Thomas yielded peacefully to Conant's tramping in with his entourage. When Conant figured out the problems at Cape Ann, he decided to leave. Thomas assisted in that move but also kept a footprint at Cape Ann. The list can be extended but not now. What we want to do now is describe how Thomas and Margaret lived when the other planters (Roger, etc.) left the glories of Cape Ann (note: we're talking the period from the exodus of Conant's crew and the order by Endicott to bring the house to Salem). Also, the "they" here refers to Thomas and Margaret. They lived in and kept up the house. Endicott knew Thomas from the house, for one thing. They tended the plantings. No doubt, cuttings and seedlings were moved to Naumkeag. But, the mature plants continued to thrive and to produce. So, produce would have been consumed at Cape Ann and brought to Naumkeag/Salem. They had game, fish, and a very pleasant environment. The Indians were friendly. They raised their children. Thomas, Jr. was educated enough to lawyer. Richard and John were both noted for their knowledge. George and Samuel excelled in several areas. Joseph was of sufficient capability to do legal work and to be a military officer. The girls all married well and had admirable offspring. From when this? This? Yes, where did the kids get their knowledge, good character, and civilized mien? From their parents, of course. We know that Thomas was referred to respectfully by Endicott. As well, Margaret must have had good learning (like her daughter-in-law, Ann Downing). In short, that just above describes an idyllic life. Think of it. The church people went off with Conant. Thomas was not puritannical (we'll go on about that). Those who were still in the Cape Ann area respected Thomas. There would have been communications with the Salem people. Back and forth they would have gone. Remember, the troubles (famine - we're not talking Plymouth or Virginia - the New England early folks under Thomas thrived - what they did not do was return an abundance back to the old country - false expectations, remember?) did not start until after Endicott brought in more people than the resources could handle. But, Thomas and Margaret got their kids through that, too. And, the Cape Cod folks would have come around now and then. Too, John Tylly would have visited now and then. The real question is why the lingering puritannical mindset could not see Thomas for what he was? Good question. Thomas went to the General Court once, 1637. This was after he took the oath (notice the gap - as said, he didn't need it - he did it for his kids' sake). Methinks that he would rather not interface with such. We see this same sort of dynamic now. In fact, Thomas stands out in several discussions about what happened to the American dream. 03/18/2014 - Lucy Larcom wrote about the wild roses and strawberries of Cape Ann. Strawberries were plentiful in some areas, however they were cultivated, too, prior to the arrival of the Europeans (Russell's Indian New England before the Mayflower). John Smith included strawberries in the list of plants that were managed by the Indians. That is, wild plants would have been organized into a fashion more easily cared for and harvested. Hybridization that resulted in what we now call strawberries was not accomplished for another century. Anne Bradstreet (see D.B. Kellogg) wrote of the strawberries that they feasted on after the long voyage. She also wrote of the illness brought with the folks as well as the lack of resources (such as food) to support the influx. ... The fact is that not only did Thomas' crew come prepared to "plant" and thrive, they had the wherewithal to accomplish the feat. ... What they were not properly prepared to do: become an exporter of excess product from the get-go (notwithstanding our advantage at looking back from a more enlightened - supposedly - framework, going off unprepared remains the experience of a whole lot of humans). What did Thomas think of all of those new entrants who created more demand than could anyone hope to supply, with what they were capable of then? Higginson, at least, stressed people coming prepared to support themselves for a year. 03/20/2014 -- Perhaps not idyllic, yet successful in most reasonable senses. It occurred to me, as I was researching material related to Cape Ann and Thomas Gardner, that I ought to explain one of our interests. We can use genealogical forensics, as a loose example but a not weak analog (reminder - we are more than a few steps removed from fictionalized history - which, by the way, is a respectable field. How else can we get the movies, etc., out for popular consumption?). Now, let's use the recent case related to Richard III (notwithstanding that some proposals have been found to be without merit) as it is an example of another type of forensics, namely anthropological. 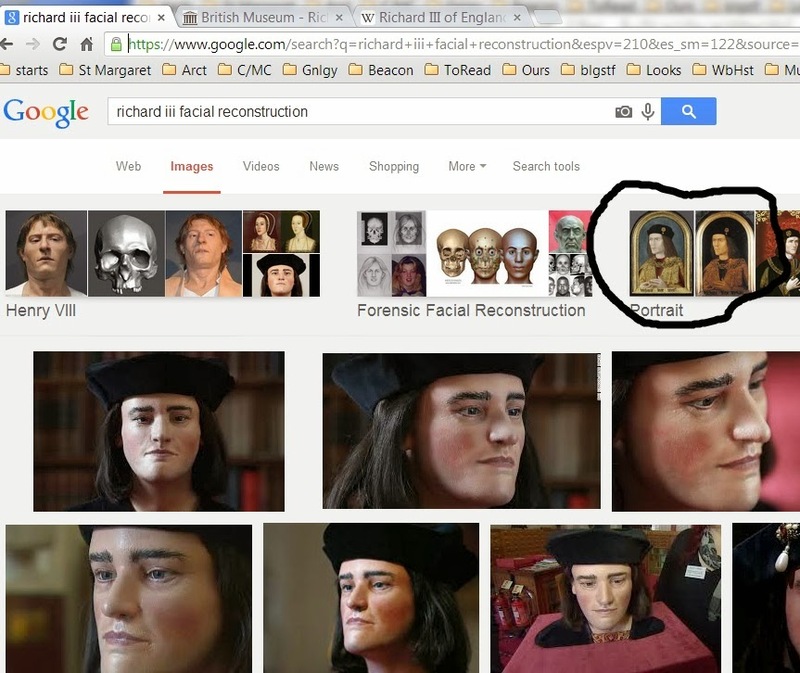 The image shows the results of a Google search on the subject of the reconstruction that was done from the remains that had been found and identified as belonging to King Richard III. By the way, The British Museum has an exhibit about this discovery. The reconstruction looks a lot like what we saw with the portraits (see one of Wiki's image). So, one might consider that it (see the circled part in the image) was factor in the work. After all, how many Brits would not have Richard III imprinted on their psyche? However, consider that similar efforts can be done with much fewer pieces. Too, as we know, a lot can be said about an individual from a small collection of data, sometimes (that being said, "big data" peoples, your aggregates of me, and many - most? - are way off base). Before we go further, I need to point to the Forensic Genealogy Institute with whom I have no association. I am a private person, doing gentleman science - let's talk about that (in company of Faraday and a whole lot more). Disclosure: I am not a genealogist, historian, and a number of other things. What I do know are mathematical modeling (especially that which is computationally framed), many of the liberal arts and sciences (does that date me? ), some military affairs, business/economics/finance, and a whole lot more. Actually, the best description would be autodidact who has broad interest. Too, I have known Gardners for almost half a century. By the way, I have mentioned anceSTORY, before. The name has a lot of meanings. Yes, there are the dull details of the past. Too, there are those things that are known (and some were very clamorous - you see, people haven't changed much - I prefer Teddy's walk softly adage) and written about. Is that not history? But, then there is "being" (the larger story that is not captured by historical accounts - but, that is rectified now and again, see Joseph Hodgkins, as an example, albeit that McCullough could start with letters -- don't forget, though, that we can get to Heidegger, et al, to boot). That is what we're trying to capture. Needless to say (but I will anyway), we must start with what we know. That means, in the real sense of science, what we have found out so far. In the case of Thomas Gardner (and Margaret), there does seem to be a whole lot of holes to fill in. Looking into expanding the base of knowledge is one task. I have only been at this four years, but I do not see evidence of any concerted, long term, effort to fill in the pieces (if I have missed something, let me know). Too, though, would be to fill in pieces (using arguments of various strengths) as best we can using modern means. How effective this type of effort might be will become apparent as will its benefits as we go along. Naturally, success will be best ensured if the brain is engaged during the exercises. Moral: People were. That they (or information about them) might be acceptable to genealogists, or not, does not change the truths of their existence nor the reality of their continuing influence. 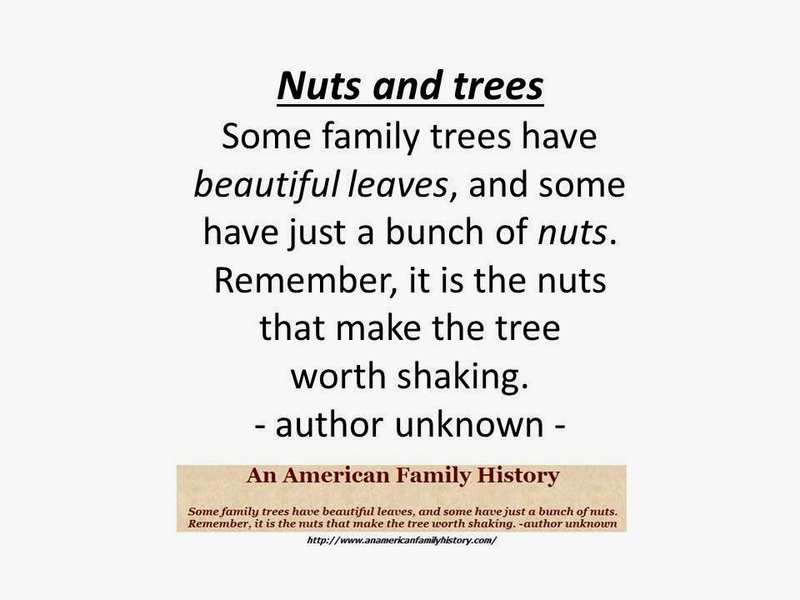 Ought genealogists take lessons in how hubris is always just around the corner? As in, genealogy might help "flesh out" the truth; it does not define such. 03/03/2014 -- New science? Yes, bringing memes (and more) to the fore in the discussion. In the terms of Thomas, his progeny has a wide sweep, including the step-progeny. ... Of course, genealogy can apply to more than biologically framed lineage. For instance, mathematicians have their "ancestors," know about them (and their contributions), and honor them. What other field does that? My mathematical pedigree: Galileo Galilei (1585), Vincenzo Viviana (1642) Isaac Barrow (1652), Isaac Newton (1668), Roger Cotes (1706), Robert Smith (1715), Walter Taylor (1723), Steven Whisson (1742), Thomas Postlethwaite (1756), Thomas Jones (1782), Adam Sedgwick (1811), William Hopkins (1830), Arthur Cayley (1864), Andrew Russell Forsyth (1881), Edmund Taylor Whittaker (1895), G.H. Hardy (), Edward Charles Titchmarsh (), Andrew P. Guinand (), Lucio Arteaga (1964), the blogger (). I took it back to 1585 since that would be co-temporal with Thomas and his parents. Too, note that the ancestor is an adviser or mentor or tutor. This brings to mind that a meme'tic look at descendancy would consider the influence of step-child-ness. I have found many of these relationships. For instance, for Thomas and Margaret, retired Supreme Court Justice Sandra Day O'Connor is a step-descendant. Thomas Dudley has a slew of step-descendants as do many due to early deaths and re-marriage being so common. 03/24/2014 -- Read, recently, a review in the WSJ (Book Review, March 7, 2014) about the work of Anthony J. Martin, a paleontologist. There was much discussion about determining dinosaur look and behavior from minimal evidence. That is, even footprints can be used in lieu of bones. The key, of course, is being knowledgeable enough to extrapolate from the small set. Too, there is information in the limiting factors. ... We can similarly reconstruct a scene from the past, with care, so as to be able to look at it from our later advantage point. 04/25/2014 - Genealogy almost seems to say: without papers, you (and your ancestors) do not exist. We know that this is silly thinking (albeit, probably not recognized by those who do such). Attempts at extrapolation (like, what was over the pond for an ancestor prior to their departure) or interpolation (filling in missing pieces) ought to be given more credence; that is, such attempts are more than mere science fiction or fictional history. Why? Ichnology allows grand portraits from seemingly minimal amounts of stuff in hand. Of course, the discipline has known rules. Also, from time to time, something comes about that affords verification (and calibration). The same techniques could be applied to the ancestral realms (and has been, again, in the fictional form). So, that is something on our plate, discussion of such methods and of their use (with demonstrations). 08/19/2014 -- Put in links to the WSJ review of Martin's book (see 03/24/2014). Also, link to ichnology's use. Now, with regard to genealogy, biology, and sociology (etc. ), we will be getting back to the discussion, in particular the interplay of memes and their analog. 07/12/2016 -- Added context at front of the page. Did we miss something? Captain John Smith came over to New England in 1614/15. 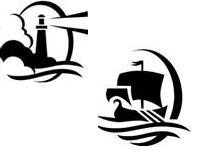 We're only two months into this period, so there is still time for Cape Ann to celebrate. 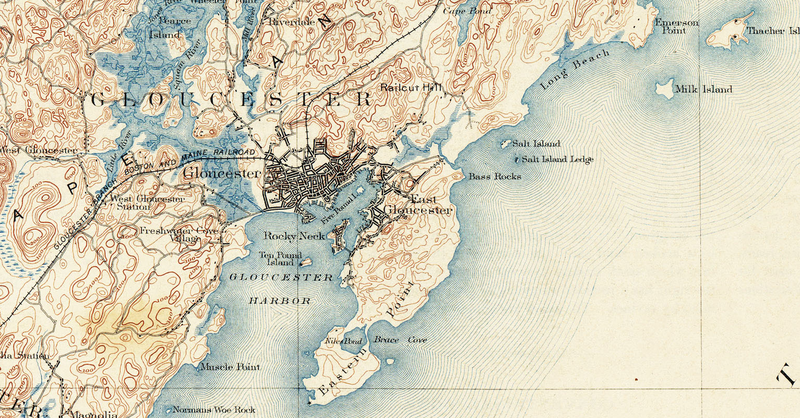 Yes, Cape Ann was named after this exploration. Celebrate? Yes, in terms of the 400th anniversaries that will string along keeping New England in a jolly spirit for many years to come. The parties this time will make the 300th pale in comparison. However, our 1st cousin - Dr. Frank A. Gardner - was there for the Salem festivities. For some reason, Cape Ann does not get the attention that it deserves. But, we can start to pull the research together now, 2014, as part of our effort at remembering (and honoring) what went on there in that seeding place. The crew lead by Thomas Gardner got to Cape Ann about ten years later as part of a commercial fish and plantation effort under the auspices of the Dorchester Company which was headed by Rev. John White. There are connections with White and Conant. How Gardner relates needs further study. In essence, we know Thomas and Margaret through their progeny. One thing that would have been accomplished the first year was erecting the "great" house which would have been ready for their first New England winter. This house was later moved to Salem on the order of John Endicott. John Winthrop beer'd and dined in this same house on his arrival at Salem in 1630; at this event, he enjoyed strawberries that had been picked that very day in Cape Ann (per his journal). The next Gardner Beacon (Vol. IV, No. 1) will take a Cape Ann focus, especially in the period prior to the exodus. By the way, Thomas showed character when Roger showed up. Many write of the Dorchester crew, under Conant, leaving that area to go to the area that became Salem. However, left at Cape Ann was the house and their plantings. Too, the distance is minimal. It would make sense to consider that Thomas remained active at both places. In the Salem area, he would have been involved with the settlement. In Cape Ann, he would have kept the house and the plantings in order. In fact, harvests at Cape Ann would have been brought to Salem. We have no note that Conant found starving people at Cape Ann when he showed up. Rather, those there were boisterous and contended well with their Plymouth neighbors. In essence, the crew was fit and sound. Now, we know that they did not succeed in getting beyond subsistence. Hence, Rev. John White's Plea will follow us forever. Thomas' name does not appear with the planters who were named explicitly (see Written out of History). Some have tried to enlarge the list (see Phippen plus). There was an effort before the 300th to form an Old Planters' society. On further look, though, one might argue that Thomas did not have the cloud over his head that worried Conant and his guys. We know that he was there as Endicott refers to him in 1629 as Mr. Gardner. But, we have other unknowns from the crew. For one, John Tylly needs some attention. If we take Phippen's list, for instance, we ought to document each of those guys and their families. Some are already well-studied (Woodbury, Balch, Trask, ...). For all, we need to create a lasting presence through publication and discussion. 03/02/2014 -- Added piece of a topological map from 1886 (courtesy University of Texas).